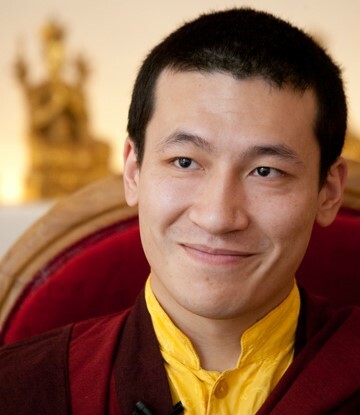 Gyalwa Karmapa was born in 1983 as Tendzin Khyentse in Tibet. Very early on, his father Mipham Rinpoche, who himself is a realized meditation master, gave him a traditional Buddhist training. In 1994 the family escaped to India, where Gyalwa Karmapa of the 14th Shamar Rinpoche, Mipham Chökyi Lodrö, the second highest teacher in the Karma Kagyu tradition, was recognized as the rebirth of the 16th Gyalwa Karmapa, Rangjung Rigpe Dorje. From Shamar Rinpoche he also got the name Thaye Dorje. Gyalwa Karmapa began his training with teachers from all four major Tibetan schools: Shamar Rinpoche, Khenchen Rinpoche and others from the Karma Kagyu tradition, Chobje Tri Rinpoche and Luding Khen Rinpoche from the Sakya tradition, his father Mipham Rinpoche from the Nyingma tradition, and Professor Sempa Dorje from the Gelug tradition. The 17th Karmapa continues the activity of its predecessors worldwide. He has spiritual responsibility for more than 900 monasteries and meditation centers worldwide. Since 2000 Gyalwa Karmapa has been visiting Europe regularly. In August 2007 he came to Möhra for the first time and blessed the Dharma Center Möhra. The Karmapas are among the most important holders of the teachings of Tibetan Buddhism. The first Karmapa, Düsum Khyenpa (1110-1193), was considered to be one of the most important lamas of his time. Before his death, he hinted to his students that he would accept birth again in Tibet. The second Karmapa, Karma Pakshi (1204-1283), is thus the first consciously reborn lama of Tibet. Since then, each Karmapa incarnation has made itself clearly recognizable as Karmapa through its behavior and has been confirmed by a realized disciple of the last Karmapa as its incarnation. The Karmapas are regarded as great bodhisattvas, i. e. as beings who repeatedly give birth for the benefit of others. In their incarnations, they have always made an important contribution to the authentic preservation of Buddhism in Tibet, and the 16th Karmapa, Rangjung Rigpe Dorje (1924-1981), has also made a major contribution to the teachings of Tibetan Buddhism being accessible in the West.